A few weeks back, we featured Angel Villegas Del Rosario in what would be our first edition of "Collectors Corner". 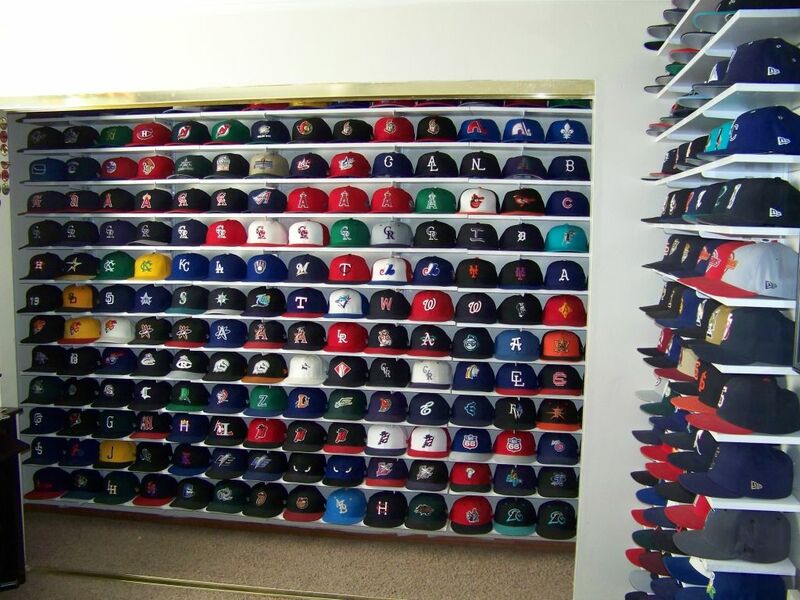 In that feature, we displayed Angels' incredible collection of fitted caps, broke down a few that were his favorite, and learned the story of his journey to enlightenment by way of 7 3/8. Today on TFD, we take a look at another collector from California, who has amassed a respectable collection of his own. As you see above, he too has seen it fit to build a shelving system to provide space for his addiction. Take the time now to meet John Beare, of Victorville, California. TFD: When did you first start your collection of fitted caps? JB: I started collecting select caps in the early 90s. The first caps I bought were exclusively of teams I liked. 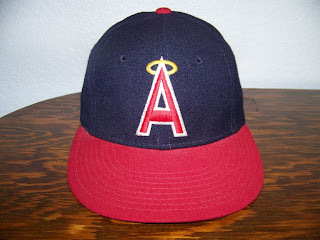 I grew up a California Angels fan, so I had one of those. I've had a fitted Colorado Rockies cap since their inception in 1992. My first minor league caps were a Lake Elsinore Storm cap and a New Haven Ravens cap, who were affiliated with the Angels and Rockies, respectively. I also had an obsession with the Ottawa Senators NHL team, so I collected any cap of theirs I could find, fitted or otherwise. I was content with a couple dozen caps through the end of the 90s until I was at a local minor league baseball game (High Desert Mavericks) and there was this one fan who was always at the games wearing a different minor league jersey. Las Vegas Stars, Phoenix Firebirds, other PCL teams, and I thought I need to do that. Not only get the jerseys, but the matching caps as well. So the "Collection" proper didn't get serious until around 2000. That's also when I went exclusively New Era. It was about five or six years later I stopped buying jerseys and just focused on caps. I still have well over 100 minor league baseball jerseys. TFD: Are all of your caps New Era Brand Caps? JB: About 99% of them. TFD: Do you remember your first fitted? sadly a size too small. TFD: What size fitted do you wear? can go up or down a size. TFD: Approximately how many caps would you say you buy a year? JB: 15-20. My wife would say more. With New Era finally gaining the rights to produce NFL caps, that number will increase this year. TFD: What is your favorite sport to watch as a spectator? JB: I love to watch hockey in person, but minor league baseball games are the best if you want to relax for a few hours. 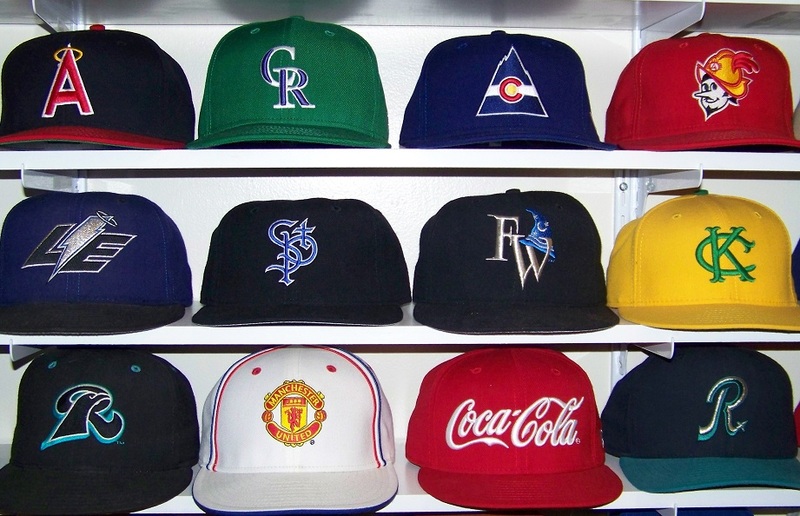 TFD: What is your favorite cap in your collection? JB: No way I could narrow it down to just one, but these are in the conversation for various reasons: California Angels, Colorado Rockies MLB, Colorado Rockies NHL, Albuquerque Dukes, Lake Elsinore Storm, St. Paul Saints, Fort Wayne Wizards, my gold Kansas City Athletics cap, New Haven Ravens, Manchester United, and of course my Coca-Cola New Era fitted, since I'm obsessed with that drink as well. I also love my Riverside Pilots cap, but it's a New Era adjustable. TFD: How many caps do you currently own? 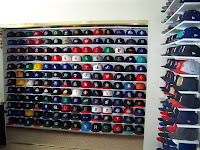 JB: What I call my "Permanent Collection," meaning the caps that are always displayed on the wall, is well over 300. The older caps and non-New Era caps, I'd say around 500. TFD: Which was the most difficult cap in your collection to find? Rockies cap. I'd hoped to find one of those for years! I finally got it thanks to NewEraByYou.com, which lets you design and purchase your own MLB cap. Pretty cool. TFD: How much would you say you've spent on caps? JB: If I really thought about that, I'd probably stop buying them. Haha. TFD: What was the most you’ve spent on a single cap? JB: $160. It was an eBay auction, which included a fake jersey that I didn't want. But the cap was rare. TFD: Would you consider your collection of caps the biggest you’ve seen around? 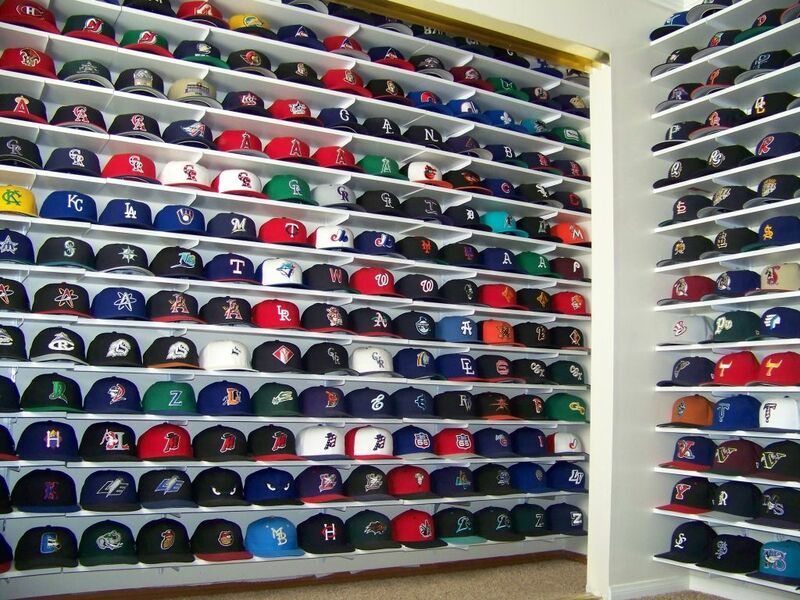 JB: No, I've seen much larger cap collections. 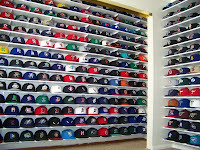 TFD: What would you say makes a fitted collection a great one? JB: Organization. When a collector can show off a collection like it's a museum, that is impressive. People see my collection and say it looks like they're in a store. Cleanliness is also important. Gotta keep 'em looking good. Mine get dusty from time to time, so I always make sure to have my cleaning kit handy. TFD: Is there any cap you still haven’t added to your collection in which you have had trouble finding? kill for a fitted one. I remember being at a Pro Image store in 1996 and they had several. I noted it because Riverside had just relocated to Lancaster, CA so these were closeouts. I passed on it. I reflect on that moment to this day when I'm trying to decide between wanting a cap and needing a cap. Will I regret not purchasing this cap? That usually wins the argument. TFD: Will you ever feel as though your collection is “complete”? JB: Never! It will always be a work in progress. That concludes the Q&A with John Beare. If you'd like to see more pictures of John's collection, get in touch with John, or simply drool over his extensive minor league cap collection visit his Interstate-19 facebook fan page HERE. Thank's to John and everyone who reads our articles. this was our 100th post, and we're still going strong. 20,000 views is just around the corner.